I found myself immersed in the Tagul word cloud generator, using the entire Networked Narrative website as my canvas, tinkering with word choices and frequencies … all in a move to paint a visual world with words and I ideas. NOTE: Alan clicked on the animation and it brought him to a sale site. What the heck! That was not my intention. Don’t bother going to animated word cloud. Sorry about that. 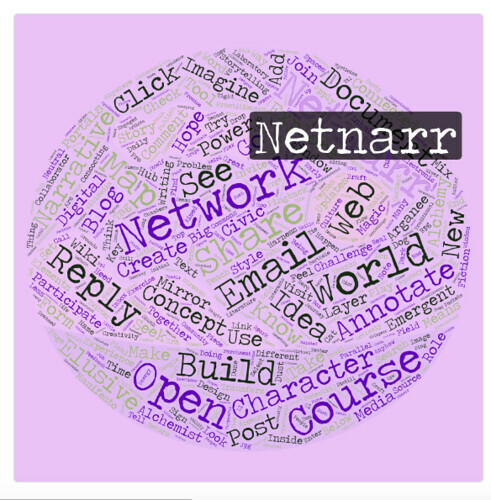 Animated word cloud: new to me! Thank for sharing this tool. (second try because of edublogs crappy captcha interpreter, which if it grades my wrong, eats my comment). This is very cool Kevin, thanks for playing out ideas why we are slow on developing the course. I like the animation, but what I don’t like is the hyperlink on all words to zazzle.com/gifts — that’s kind of sleazy in my book, and not at all what I expected.